Sometimes even pictures are inadequate to reflect reality. For nearly four month now knowledgable people following the war in eastern Ukraine were wondering and asking themselves, how long the Ukrainian army, impeded by disorganization, tactical blunders, and low moral, could go on with the strategy of throwing one wave after another of freshly mobilized recruits into the battle, hoping that the sheer numerical superiority would secure victory against the highly motivated but vastly outnumbered pro-Russian separatists. The developments of the last days have made it clear that this strategy cannot be sustained any longer and that the immense losses of soldiers and military equipment have weakened the Ukrainian army to a point, where a complete collapse is not a distant possibility anymore. 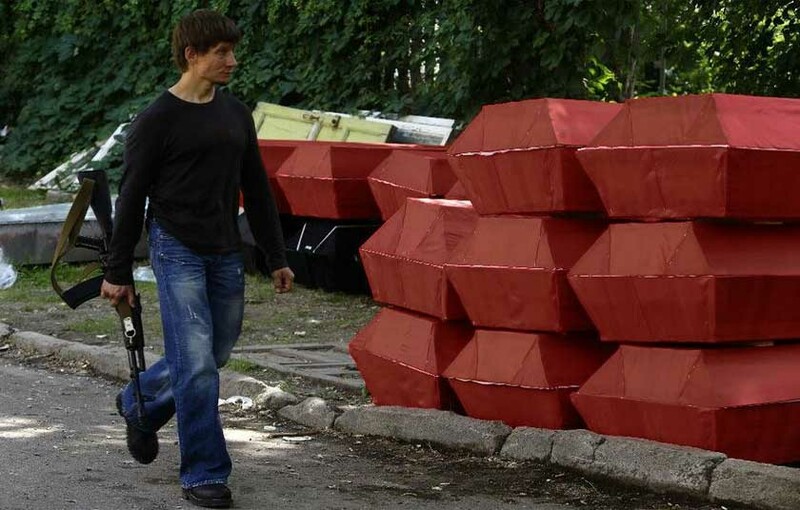 The official casualty numbers of 800 killed and 2,700 injured troops, which National Security Council spokesman Andrey Lysenko is telling, are a blatant lie, most analysts estimate the real death toll to be over 4,000. 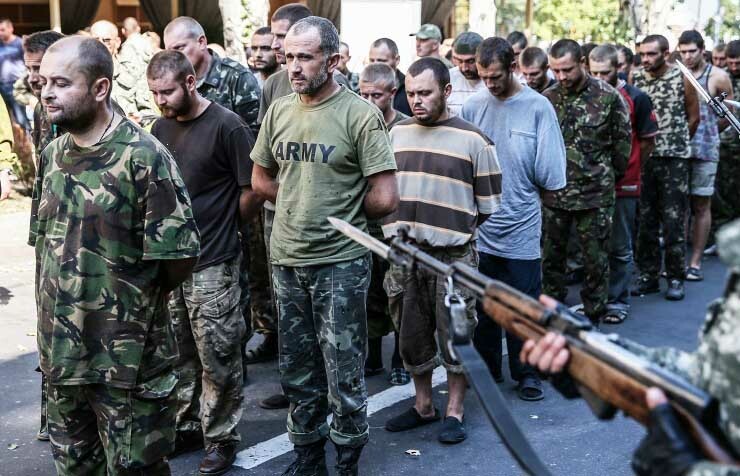 The number of Ukrainian soldiers throwing their weapons away and fleeing to Russia goes into hundreds, the number of soldiers who are detained by the separatists, is more than 1,000, alone 700 have surrendered near Illovaisk and are now in prison camps. President Poroshenko has announced a replacement of the military leadership. This would be a desperate move which only would further weaken the army which this year has seen already significant changes in the top ranks. 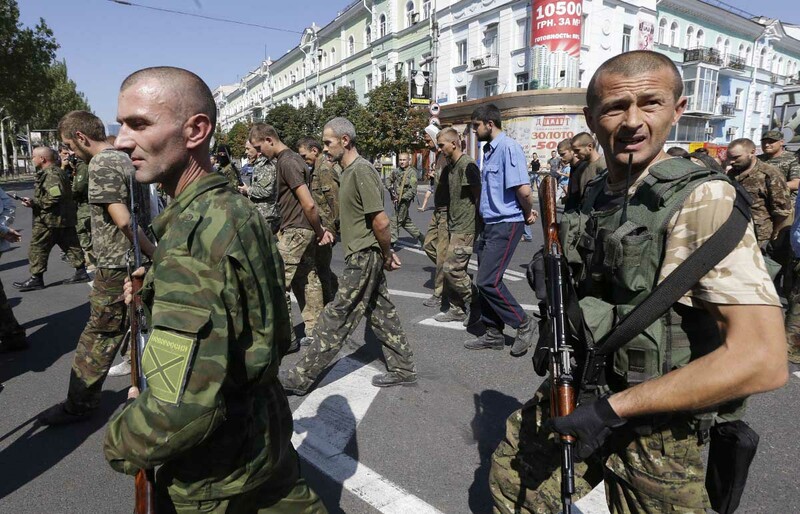 Kiev authorities have opened 1,100 criminal investigations into Ukrainian soldiers who deserted from the army. Protests of soldiers’ mothers and wives who don’t want them to fight have become frequent as soldiers tell by cellphone to their relatives that they have been abandoned by the government and their units have run out of food, ammunition, and fuel. The desperation of the army leadership is clearly shown by the indiscriminate shelling and bombing of residential areas and the use of banned weapons. White phosphorus bombs were used in the town of Mospino outside Donetsk, and there are reports about the use of fragmentation bombs and cluster ammunition. The desperation of the Kiev authorities is manifest in childish retaliatory actions, like temporarily switching off the electricity for Crimea or forbidding a start of classes in the south-eastern regions. Anyway, a start of the school year unfortunately will not be possible in many places due to the fact that 93 schools, 11 colleges, 9 university buildings and 27 preschool facilities in Donetsk had been damaged or destroyed by Ukrainian army shelling. Despite the encouraging news from the front lines, supporters of the pro-Russian separatists and enemies of the US/NATO block have no reason to be triumphant. 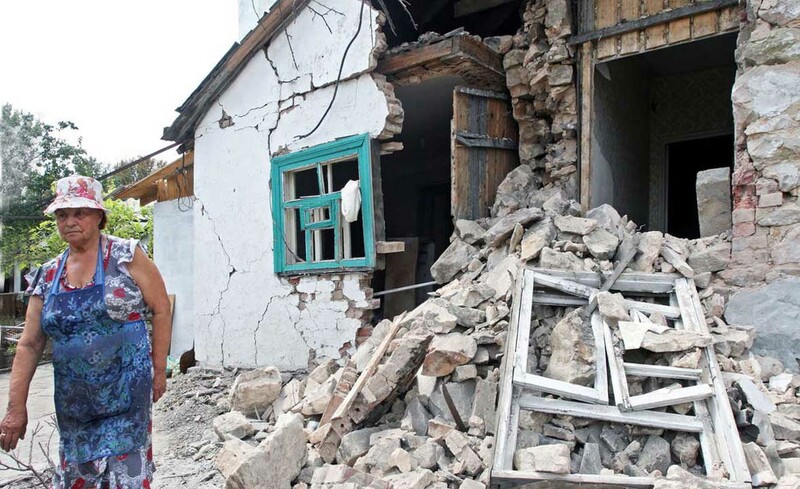 A society has been torn into pieces by war, at least 8,000 Ukrainians have lost their lives until now, the infrastructure of Lugansk and Donetsk is destroyed, and the Ukrainian economy is collapsing. It will take a long time to heal the wounds and overcome the mutual hatred and distrust. The destruction of the Ukraine is one more example that war has to be avoided under any circumstances and that taking up arms is only the last possibility after all other options have been exploited. Fleeing, hiding, disguising, faking compliance, sabotage, obstruction, everything is better than fighting and killing. Those who are lucky enough to live in a peaceful country and who never heard the sound of bomb explosions, artillery fire, and gun battles; those who never heard the death rattle of mortally wounded and never walked along streets with rows of destroyed buildings, bloodstained pavement, and body parts laying around, they should do everything to prevent war and spare them such experiences in the remaining years of their lives. The question was asked already in an earlier post if Russia could have warded off the threat of NATO missiles stationed directly on her western borders by other measures than sending “volunteers” and equipment to the Novorussian forces. Vladimir Putin, one of the most intelligent world leaders made cautious attempts to avoid a military conflict at the beginning of the crisis, calling for dialog and compromise. He made clear that any solution who would preserve the economic cooperation of the Donbas region with Russia and prevent the eastward expansion of NATO would be acceptable. But the reaction of both the Russian public and the Western leadership made it very clear that a compromise was not on the table. Russians would never have forgiven Putin the “selling out” of Novorussia. The notion, that any solution is better than war, is not a popular concept for the patriots who are far away and not directly involved in the carnage. Could civil obedience, economic sabotage, simply ignoring the government in Kiev and secretly installing a parallel administration have been an alternative? Could simply waiting for the inevitable economic collapse of the Ukraine and then lending a helping hand to new leaders have been an alternative? 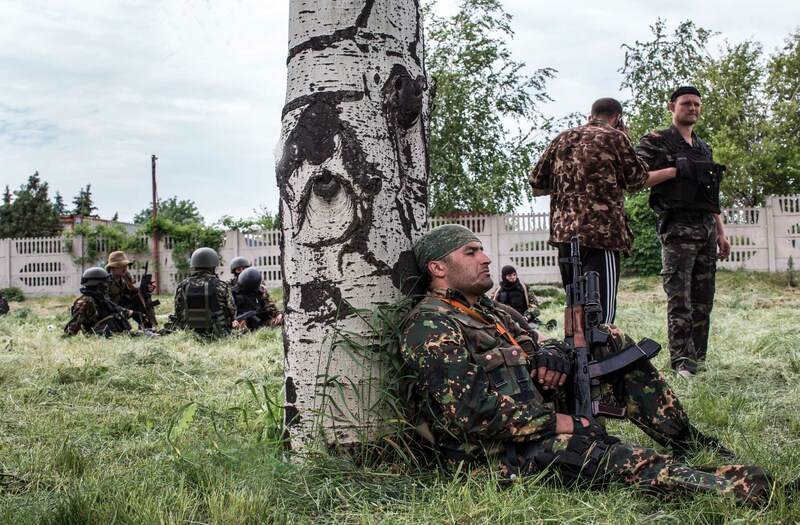 The latest post on this log with an interview of Alexej Mozgovoi, a military leader of the Lugansk forces, emphasized the dedication and heroism of the men fighting for independence from Ukranine. The following report by Russian freelance reporter Nicholas Mokrousov shows the dark sides of the Novorussian establishment. While the interview with Mozgovoi could give the impression that war can bring virtues like heroism, camaraderie, commitment to the surface, the report of Mokrousov seems to indicate that war exposes the worst sides of humanity, that war enables sadists and psychopaths of all kind to fulfill their urges unhindered by an intact society as it exists in times of peace. Kurgan’s resident Nicholas Mokrousov, a freelance reporter for Znak.com. spent several weeks in the south-east of Ukraine. He worked at the headquarters of the DNR (Donetsk People’s Republic), talked with the leaders of the breakaway republic and ordinary militia members, and followed the life of the besieged city of Donetsk. Arrested on charges of spying for the enemy, he miraculously returned alive from the basement of the DNR counter-intelligence building. Back in Russia, Nicholas wrote down his impressions, changing some names and omitting some details. His story is not standard-issue war propaganda, but a picture of the reality in a war zone. Who it is right and who is wrong remains unclear. There is a place for cowardice, generosity, loyalty, and betrayal; but most of all in this war as in all wars, there is suffering, fear, and pain. That this report was published by media outlets, which support the pro-Russian cause, shows that people are aware of the perils that the situation of war brings to society. About a few weeks spent in the DNR. Explanation: because of the ongoing fratricidal war in the Ukraine and a humiliating parade of prisoners in Donetsk, I have decided to break the agreement of non-disclosure that I signed in the basement of Army Counterintelligence DNR on July 23, 2014, and to write about what I witnessed there. It just so happened that at the time when the Ukrainian crisis flared up, I was stuck in the “couch potato” position on the correctness of the Maidan, and incorrectness of Russia meddling in the affairs of the neighboring state, the fraternal state, with the same people on both sides of the border. Yes, by the caprice of history, this nation was divided, but until recently I was convinced that this monolith cannot be broken and no one should interfere with the choices our brothers make — as folk wisdom says: “Getting used to it is half way to loving it”. However, in late June it so happened that I myself wanted to go to the south-east of Ukraine. Not because it was filled with the idea of Novorussia, but because the need to escape, no matter where to, eclipsed my mind. Very soon I remembered about the link sent by a gentlemen from the National-Bolshevik party, about the collection of donations for humanitarian assistance, and gathering of volunteers to be send to the southeast. I immediately replied and received an affirmative answer with a proposed trip and a phone numbers to reach the coordinators. On the basis of this information, I had to go to Rostov-on-Don, and from there drive to the border town of Shakhty, where I would have to call a “coordinator”. I told my family that I was leaving for Moscow, but in fact took tickets to Rostov; a couple of days later, I was already in Shakhty. After my phone call I finally encountered those who came for me — that’s when I felt the first shock. There were four people with the appearance of the kind of company one tries to avoid at all costs when wandering around town late in the evening. Together we went to a man named Maxim, nicknamed “Shukher” (”alarm” in underworld slang). A native of Kramatorsk, he moved his wife and daughter to Russia after the retreat of Strelok and began helping the militia, leading groups of volunteers across the border. Of the entire group he made the best impression. When we talked to our guide, it became clear that due to the lack of safe corridors, a car was not to be expected within the next two days. I had to wait in a safe house which served as a residence of the company that came for me. My tongue doesn’t dare to call the condition in which we found ourselves there, even though I am accustomed to a life of modest requirements. There were two rooms on the fourth floor of the small family residence on the so called Industrial Street, with mats fused to floors with gunk and filth, crumbling moldy concrete in the bathroom and quite large maggots swarming in the pots. The last remnants of romantic dreams of adventure melted away from my imagination. The rest of the evening was spent with me serving as involuntary audience for Cossack songs, clinking of glasses, swearing, and battlefield stories. All the stories were accompanied by copious libations, laughter, and very “colorful” details. For example, I learned that after the defeat of a Ukrainian division, enterprising Cossacks collected all the weapons from the dead Ukrainians and hid it covered in one place. “When it gets quieter, we come back to raise some cash,” said the Cossack. After these and other stories of these “volunteers” my further presence was impossible, and in the morning after threats against me I preferred to stay with “Shukher,” where I spent the remaining time till the arrival of the “bus” — consisting of cars that ferry volunteers. 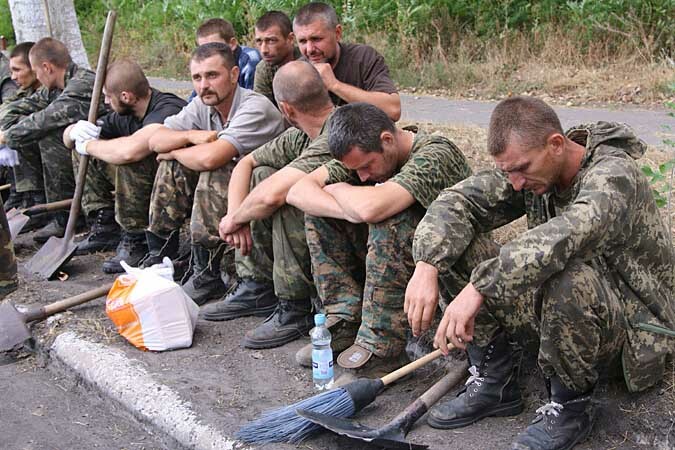 It was ordered to go across the border bypassing Donetsk (the eponymous Russian town on the border with Ukraine). At 10 o’clock in the morning from across the border a minibus was to come for us. We agreed to meet near the very apartment, where meanwhile, other people arrived — a battle group of Cossacks, it seems, from somewhere in the Volga region. There were 5 of them, led by ”Big Daddy” — a very impressive man with his son. He had quite a cheerful temperament — fatherly, solicitous of his fighters; the time spent mentoring children in his town, according to his story, was definitely manifested in his attitude. Unlike the characters which I first met, the very large number of people traveling to Donbas are not there for profit, or in search of adventure, but at the behest of their heart. People, almost without exception, with whom I had to communicate in Shakhty and on the way to Donetsk, each made a very good impression individually by their sincerity and dedication. On the way to the Russian Donetsk we encountered overfilled refugees buses where half of the passengers were men of military age. We all silently understood what is happening, except our chieftain, who exploded in angry tirades against those men that did not want to protect their home and ”run to Russia like weak women, and we have to fight instead.” In addition to civilian yellow buses, just at the border crossing, a convoy of military trucks without numbers passed us, with platforms designed to carry armored vehicles already empty, followed by the fuel truck. Similar military trucks without license plates could be seen traveling from Rostov towards Schacht two days earlier. But then on their platforms were three artillery installations “Carnation,” and two large trucks covered in camouflage, hauling large-caliber guns. Their drivers were dressed in civilian clothes only; and unlike those on Rostov highway, they were not accompanied by military traffic police cars with license plates from Moscow. We saw the military police again at the Ukrainian-Russian border checkpoint “North”. We crossed the border without too much difficulty, except that the driver suggested that we pull the Russian sim cards out of our phones — so as not to be intercepted. A feeling of different, military reality, did not leave along the way. A particularly strong impression was made by Lugansk. The picture I saw there may be familiar to any movie fan of disaster and post-apocalypse subject. A large and empty city, at that time only battered in the suburbs. During a half hour ride through its streets, we met (at most) a dozen cars traveling or standing on the sidelines, and a dozen passers-by. And that’s in a city of almost half a million people. It was dark when — having passed the last major roadblock with a paneled armor “Ural,” topped with a heavy machine gun — we got to Makeevka; where, to our surprise, we had a whole floor of a hotel rented for us. In the afternoon I got to Donetsk, where, except for its emptiness, nothing reminded of combat close by; a big, beautiful, clean city with fountains and roses on the streets. On the first day, passing checkpoints and battle sites, I found myself in the hotel where a debate club was meeting. There, surrounded by professors, philosophers, economists, and students I almost lost the sense of war on our doorsteps. Even before the events in the club I met with a guy belonging to the local political leadership. I well remember his words about the nature of this “Russian Spring”: “In 1991 there was a revolution of lawyers and financiers, but now we are here — a revolution of the historians!” All ideologues of New Russia have a historical education background. After a brief conversation, Eugene (the man’s name) led me to Pavel Gubarev, who made an impression of being a very simple “man of the people.” He shook my hand and asked where I was from and how my trip was going. Nothing beyond small talk — Gubarev was too engrossed in conversation with a group of supporters. The next day I started working at the headquarters of the political leadership of the army of DNR, which occupied the office of the “Union of Industrialists of Donbass,” more popularly known as the ” Taruta Palace”. Taruta was the governor appointed by Kiev shortly before the declaration of independence from Ukraine in Donetsk. I worked as a correspondent and in the research department. Normally, the work was about putting finishing touches on press releases and monitoring public opinion. From a professional point of view, the work was interesting, but I felt it was not for that that I’d come there. 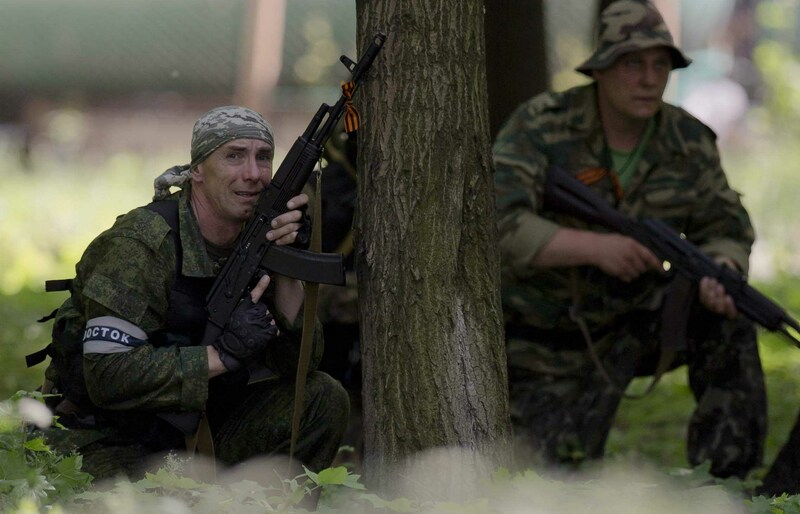 The sensation of the war eroded in the first week, among other reasons, due to ongoing activities by the DNR. There were even real balls — meetings of local residents with the militia, rallies; concerts, with performances by local musical groups and speeches by local government representatives. Such events had the most beneficial effect on people, they reduced anxiety and intensified belief in victory. However, each successive rally became less well attended than the previous one. Generally speaking, the people who voted for independence were divided into two unequal parts. First, those in the majority, thought that the declaration of independence was only a necessary step to be followed by the immediate recognition of the republics and accession to Russia following the example of the Crimea. This also partly explains the outflow of people to the side of the Russian Federation with the beginning of the ATO. The second group (and the more intellectual part of the population) are supporters of the independence of the Novorussia both from Ukraine and Russia. They advocate the nationalization of mines and enterprises, which, even while on the territory of the DNR, continue to work for oligarch Rinat Akhmetov. These people have a better understanding of the idea behind Novorussia, and perhaps that’s why some of them are still in Donetsk. There was a meeting organized by the “Initiative Group of people of Donetsk” in one of the halls of the Union building. It was called simply “A Rally Against the DNR.” We, together with the analytical department, were sent there. Attendance at the event, given the conditions, was not particularly large. People taking responsibility in a semi-underground status, had organized the meeting with the vice-mayor of Donetsk, Constantine Savinov, and the DNR representatives, one of whom was Pavel Gubarev. His speech took a very long time. Pavel, who in my opinion, is genuinely interested in minimizing casualties, addressed the audience with a call to anyone who still had the opportunity to leave the city as soon as possible or, if this was not possible, to stay closer to the center. The fighting is soon to reach the outskirts; the city will be bombed, he explained. His declaration elicited a wave of outrage in the audience. People began to ask questions, to demand an end to violence and to request not to place anti-aircraft guns on the roofs of high-rise buildings in order not to put civilians at risk. 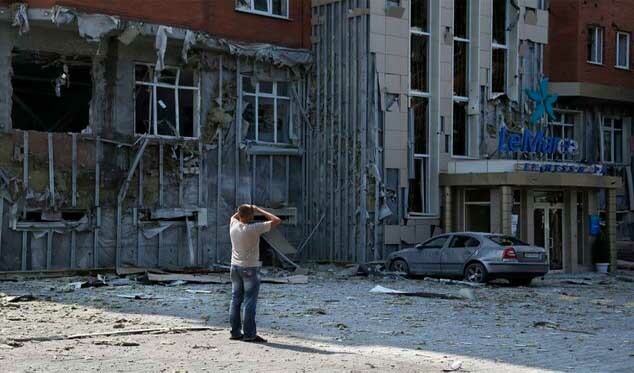 Gubarev pleaded ignorance about facts of placing anti-aircraft guns on the high-rise buildings, explaining that the violence can be stopped only when the Ukrainian side will be interested to do so. After him came the vice-mayor Constantine Savinov. Describing the humanitarian corridors, he also asked everyone to leave Donetsk and proposed a DNR cease fire. A few minutes later, Savinov, his assistant, and some of those who asked too many questions, were detained at the exit by DNR soldiers and taken away to an unknown direction. The Militia was not embarrassed that the detention was witnessed by foreign journalists and a representative of the UN Human Rights Commission. The remaining residents made a plea for a UN peacekeeping contingent to be brought into the conflict zone. When we returned to the headquarters, there was information about the landing of a Polish heavy armored brigade in the port of Odessa, and on the evening of the same day, the main theme of all the world’s media was the downed Malaysian Airlines Boeing. A feeling then of being on the brink was perhaps the clearest at any point since my arrival. The next day the town was bombed. The first mortar attack hit the area of the “Precision Machinery” factory and a residential neighborhood adjacent to it. The factory was already abandoned by this time. A shell landed at one of the shops, a fire started, and smoke was visible from any part of Donetsk. In the residential neighborhood, by a miracle, the only damages were flattened fences, torn power lines and exploded gas pipes. When our crew arrived at the scene, we found the people in a state of panic and confusion. Residents left without electricity spilled into the street, cursing the war, “the junta” and Poroshenko. They began to collect things. Somewhere in the distance the incessant volleys of artillery could be heard. 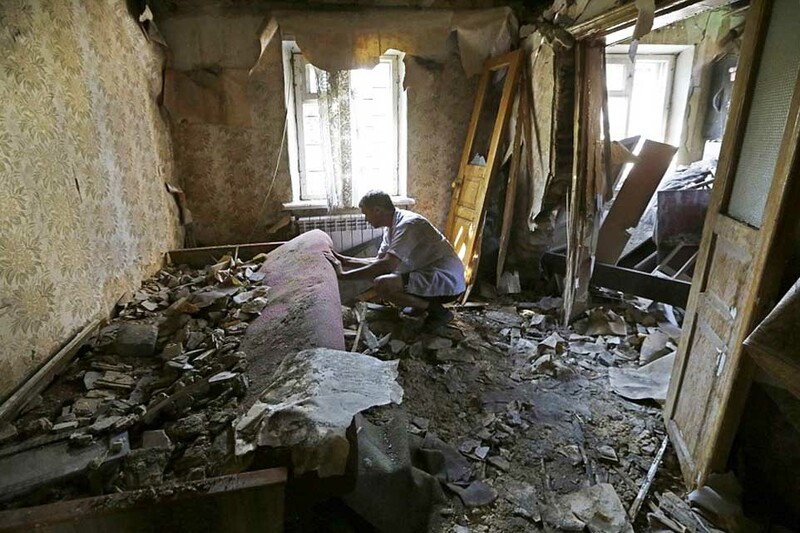 It was not clear exactly what the targets of the Ukrainian artillery were. But looking at the damage to private houses, it became obvious that the war had come to this city; and that the Ukrainian artillery shoots regardless of whether there is any military object in the targeted location. After all, neither “Precision Machinery” nor the village housed any military installations and the militia was not present. 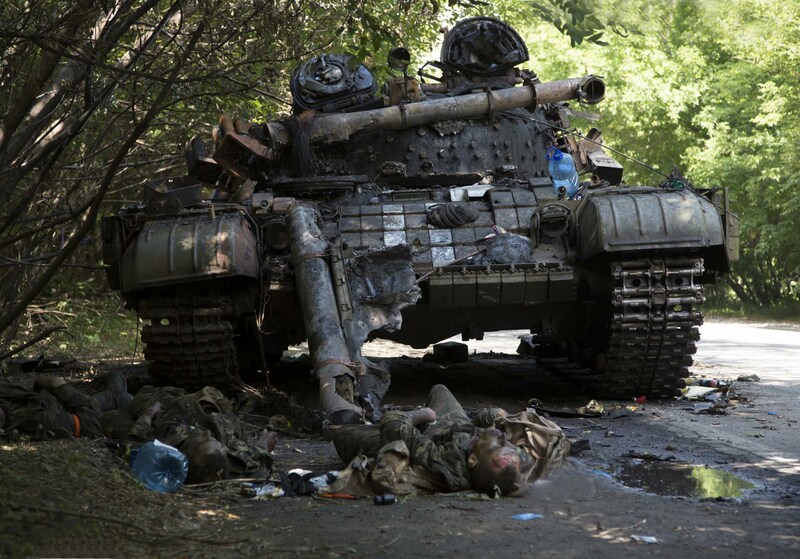 On the same day in the area of the train station, after having destroyed the roadblock, a group of two Ukrainian tanks and four armored personnel carriers entered the town. After a short battle, the column just as easily retreated back to the positions they came from. At the station, four militiamen and one civilian were killed. Back at the headquarters it was explained to me that such attacks were conducted by the Ukrainian army to produce mass panic and, as a consequence, to reduce the loyalty of the people to the DNR. To counter this, it was thus necessary to create positive background information; in particular, to write more about victories, which work was offered to me in a group of correspondents. I liked the idea. Suspecting nothing, I went to the supervisor, asking him where to get information and to receive reports. His response surprised me. He looked at me puzzled and explained, that access to the data of the actual results of operations would not be available to us or anyone else, and that we would have to write about winning from our imagination. Following in his steps, one of the department heads came in and happily announced: “Tonight there was an enemy column destroyed and 150 people wounded. Come on, launch the news. But do not write about wounded, just about a column of armored vehicles. Ukies will not deny it, but they will say that they have no losses.“ Not finding the strength to write this, I resigned from the correspondent department and moved to department of analytics, where I had been helping previously. Perhaps the most common theme in conversations of residents became lawlessness perpetrated by armed men with DNR stripes. In particular, the so-called “spin,” when men in uniform — under the flimsiest pretext — just threw the owners out of their cars. If the owners resisted this expropriation “for the good of the revolution” they were taken away to an unknown location. Every day, people’s discontent grew. There were social problems with a delay or non-payment of benefits and pensions; disregard of the law by some representatives of the DNR; deficiency of the laws passed by the Republican government. Meanwhile, more shops in the city stayed closed than open. Every night the sounds of explosions were getting closer to the city, now large-caliber guns and “Grads” could be heard. All the information that I received from the people and conveyed to the authorities, the questions that I was asking at the headquarters, and the pictures that I took, finally doomed me. In the last week of July I was escorted out of the building by four machine gunners with plastic handcuffs on my fingers (a very original way of tying, but at the same time quite effective) and an improvised bag over my head, made of towels and scotch tape. I was detained on suspicion of propaganda against the DNR and spying for the Ukrainian side. I cannot say I was severely beaten, nothing like that — except a verbal threat to cut off my finger. At this point the most disgusting realization was, that the person I was very sincerely trying to help thought I was a traitor — although in the time of war such a reaction is understandable. We conversed till evening, and there was a question about my future fate. As a crime against the DNR was not found, they decided to let me go. Signing a statement of non-disclosure addressed to Igor Strelkov, I waited for confirmation. “Who are those?” asked one of the counterintelligence. “Pravy Sektor,” said the guard, showing the package with the arm bands. The guys were taken away up the stairs, and after five minutes through three floors that separated us, I heard terrible screams that lasted about half an hour without stopping. “They are doing dental work,” said the guard. “Teeth pulled,” quietly added a second. I was sent to sit in the next room, and there the screams became softer. I do not know how and why one would need to come to the territory controlled by militias, having in his luggage these bandages. No explanation other than “in search of a long and painful death.” But the guys did not look like suicidal masochists. When the screams subsided, someone walked down the corridor, and from the conversations I gathered that one guy they are torturing does not admit that he is “pravosek.” Later, I heard someone was dragged into the basement, where once again I heard kicks and muffled screams. Soon the Chief showed up. He went down to the basement, and then cries subsided. Then he came up to me and said that I was free. A Militiaman introducing himself as “Musician” escorted me to the entrance. We shook hands and he apologized “if something is wrong.” I did not have any anger or fear, but on the way out my hand reached for the cross, which was handed to me on the eve of these events during a religious procession. And I, who was always skeptical about any religion, I kissed it. Not for myself, but for those unfortunates that stayed behind. I could not go back to the headquarters and there was a question of where to stay. Walking around town before curfew, I realized that all buildings, seemingly lifeless, were, in fact, filled with armed men, and it was unlikely they would be happy to see a stranger without documents. Besides, I remembered the words of the staff officers about the dislike ordinary militiaman harbor for the press and its representatives. Return to the basement was also not desirable. I could get accused of conducting a reconnaissance of positions and sent to the company of alcoholics, drug addicts and others caught throughout the city, for “occupational therapy,” digging trenches. After thinking about it, I went to the state administration. There I got lucky, for although this was a restricted security building, after a story about what happened to me, the commander of the security called “Daddy” allowed me to enter. He asked for the dining room to open, where I was heartily fed, and then sent to the fourth floor, in the hands of “Petrovna,” an enchanting woman, as worthy as “Daddy” himself of a separate mention. They were wonderful, honest, rare people. Climbing up to the place, I found an office, converted almost to a real a hotel room with air conditioning, wardrobes, and improvised beds, made from office desks. Given three meals a day, the conditions were luxurious. Besides, I had this room all to myself. It was a pity that it was becoming more and more dangerous to stay here, and even if I learned to live with the everyday bombings, the feeling of being under possible surveillance as a spy was really uncomfortable. The flames were fanned by an incidental encounter, which occurred the next day. Climbing the stairs, I came face to face with the person who had questioned me in the basement of the SBU. We shook hands, smiled and even exchanged a few pleasantries, but I had a feeling that he was there for my soul. On the same day, I got on the phone with a man from Moscow, with whom we had traveled from Shakhty, and told him what had happened. His advice was short: get out, and the sooner, the better. Having access to the government of DNR, he arranged for me to meet with one of the most important officials, who in turn immediately took me to a department dedicated to the evacuation of refugees. I was put in a queue and marked to be the first to leave. However, the “safe corridors” did not exist in those days, the Ukrainian army having surrounded Donetsk. Roads and settlements, which not so long ago we all went through to Makeyevka, were now in the hands of the Ukrainian army or had become places of fierce fighting. How long all this would last was not clear. But there was an opportunity to talk with ordinary soldiers, contacts with whom I had been deprived of, when doing office staff work. 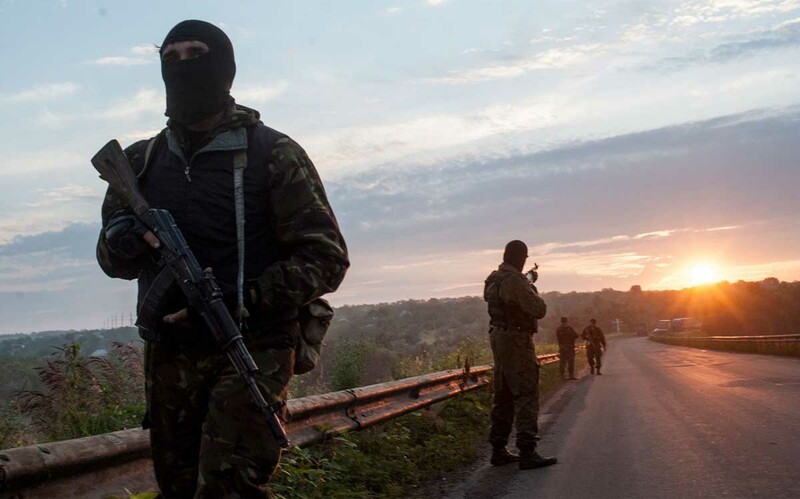 By this time it had finally became clear to me that the war occurring in Ukraine has long ceased to be a geopolitical clash and was in fact a full-blown civil war for both sides of the conflict. The idea of independence, the desire to create their own Novorussia free from Ukrainian defects, or the desire to join the Russian Federation had been replaced with the banal thirst for blood, the need for revenge. I looked into the eyes of these people, and felt uncomfortable with the scale of the tragedy that the propagandists had brought upon this formerly peaceful land, upon each house, each family. The evening of July 26, my phone rang. The voice in the receiver told me that the corridor had opened and if I’m ready to go, then the next morning I have to be at the “McDonald’s” in the market area. I went there, joining more than a hundred refugees who were already waiting. The bulk of those were women and children, families of militia. Opposite to what I noticed when arriving at Donetsk, no men. Perhaps, it was due to the fact that the commander in chief issued a decree to ban men of military age from leaving. A few guys from the militia were there, one of whom, judging by the plaster cast, was wounded, and the other three, as it turned out, were citizens of Russia. Half an hour later four minibuses arrived, among them was the one on which, together with the ” Shukher ” and the Cossacks of Russia I had gone in. With luggage loaded, everybody in place, and accompanied by three militia cars, we started. At the first stop, I met the guys which accompanied me when I went to Donetsk. Agreeing to stick together, we chatted along the way about the time I spent in the southeast. One of the other men, Ivan, asked how I got to Donetsk. Hearing the name “Shukher” surprised him. I’ll probably never know if it was true or not. Our conversation was interrupted by the hum of jet aircraft. Someone said that it was a Su-25. We were asked to move away from the buses. The plane went in the direction of Lugansk, two muted shots sounded in the distance a few moments later. The sound of engines was heard briefly and disappeared. We boarded the bus again and went towards the checkpoint Izvarino. All the way we could trace the tracks that tanks left in opposite direction. And like never before, with particular sort of pain I remembered the lines written by Anastasia Dmitruk: “We shall never be brothers.” For brotherhood will never be where brothers blood was shed.